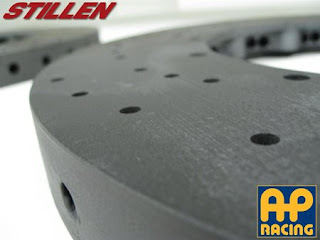 Sneak Peek: AP Carbon Ceramic Brakes for R35 GT-R. Stillen has been working on these carbon ceramic brakes for the GT-R. Back several months ago, I had a meeting and talk with Steve and Josh from Stillen. They talked a little about upgraded brakes, and I asked them then, if they were working on carbon ceramic. They confirmed it then, but this is the first photos and info on them.